If there is no "there" there, it might very well be because the government has taken all the air out of the room. I cross-posted you, btw:Citizen powerlessness flows from systemic crowding out, by governments and the corporations they make. I write from Iwate Prefecture, where I live part of the year and maintain a law office, and where a lot of my wife’s extended family lives in, per the author, towns of no socio-economic significance. This post demands comment, though it may fall on deaf ears. It’s erroneous to lump all the prefectures together on the nuclear issue. The only damage to a nuclear plant was in Fukushima-ken. No plants were damaged in Miyagi-ken, and thousands died in communities that didn’t have plants or that long pre-existed them. 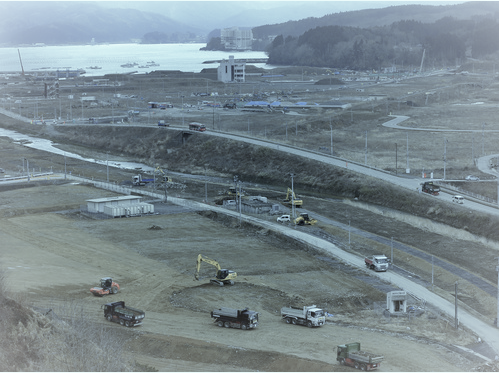 For example, the town of Onagawa-machi, one of the most devastated settlements, was established in 1889. And the residents of towns in Iwate-ken did reject all nuclear plants: there are zero of them in the prefecture. So the many thousands of deaths there don’t have any relation to the nuclear issue, much less to government subsidies for nuclear plants. Some deaths certainly could have been avoided if people hadn’t built within zones that had been inundated during past tsunami. One can see this clearly from driving through these towns and noting the locations of memorials to those who had perished in earlier tsunami. Nonetheless, the March 11 tsunami was of a so far once-per-millennium magnitude. Even building above previous inundation markers wouldn’t have avoided all the casualties of that day. The post is also reductive about the reasons for lack of reconstruction. As I know from family and professional experience, the disbursement of reconstruction funds is in no small part due to the absurd criteria applied by Tokyo financial professionals seconded to run the reconstruction agencies. For example, one construction company on the Iwate coast that I’m acquainted with lost all its equipment — and its president — on 3/11. When it applied for funding, the agency staff grilled their attorney on why the company’s profits were lower in 2011 and 2012 than they had been in 2010. No money was forthcoming. The most objectionable part of the post is the claim that the towns had no SOCIO-economic value for the nation. Only those resident in the capital or another metropolis who are ignorant of most of Japan would suggest that the merit of a community — its entitlement to exist — should be based on the size of its local GDP. But the post’s dismissive comment isn’t limited to economic criteria. Speaking as someone who has traveled among Tohoku coastal communities both before and after the tsunami, these small communities are of social value to the nation for their local folkways and traditions at least (as well as for their aquaculture), even if those in the capital don’t appreciate them. The nation loses a great deal of social value when these small towns, in Iwate-ken or elsewhere, disappear — as dozens of them did, more or less all at once, on a scale several tens of times larger than the Biblical motions of the Red Sea. Most of all, those towns had tremendous social value to the people who lived there and to their families. This post does great disrespect to the memory of those who perished, and insults the survivors with its sweeping generalizations. Tokyo has 1% food self-sufficiency. Saitama has about 10%. It may be higher in Chiba due to its coast, but I think it is as low in Kanagawa. Tohoku provides a lot of food and the coastal communities in Ibaragi, Fukushima and Iwate provide fish. How can this not be of socio-economic importance? ANd, as AJ Sutter hints at, the region provides a lot more than that to the nation.